Our Instant Pot Recipe Series continues, and we are so excited to share with you our first seafood dish! 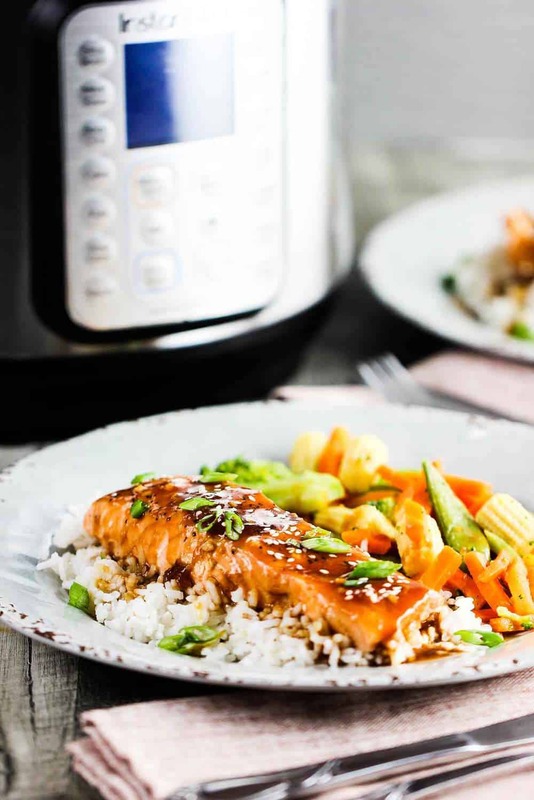 This Instant Pot Teriyaki Salmon recipe is definitely one of our favorites! 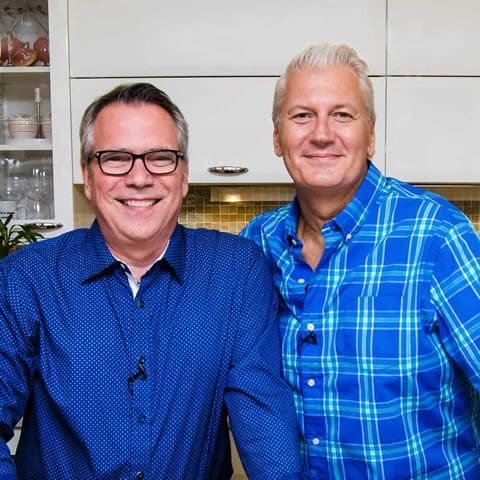 This dish is so incredibly flavorful and only pressure cooks for 6 minutes! The perfect weeknight meal that’s not only delicious, but healthy, too! You’ll need to place the salmon fillets in some sort of a vessel for steaming. I love using my 7-inch springform pan (click for easy, fast ordering), but you can also use a couple small bread loaf pans, or even make a small ‘boat’ out of heavy duty aluminum foil, loosely sealed. If using a the spring form pan, as I’ve done, just be sure to line it with foil, so none of the marinade leaks out. Pour about a half a cup of the marinade over the salmon in it’s vessel, and let it sit for about 15 minutes in the fridge. Then it only steams for 6 minutes in the Instant Pot! Amazing! Just look at that perfectly cooked salmon! Teriykai is one of our all-time favorite flavor enhancers. 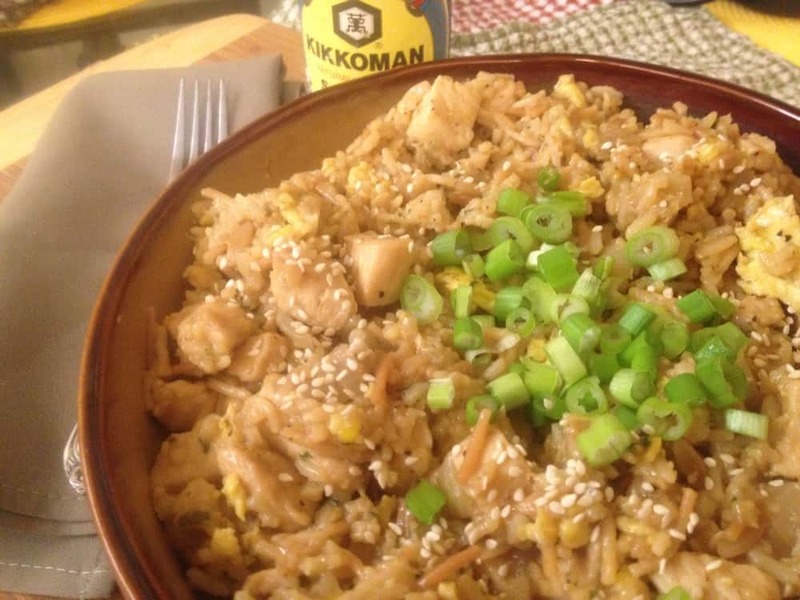 With a combination of soy sauce, mirin, sesame oil, garlic and fresh ginger…how can you go wrong? Pour the reduced sauce over the perfectly cooked salmon for a stunning presentation. 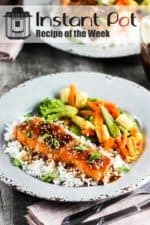 The Instant Pot is so versatile, and though pressure cooking fish can be tricky, this recipe is fool-proof and produces one of the most delicious salmon dishes you will ever try. In a matter of minutes! If you’re looking for an easy meal that is packed with flavor, and happens to be good for you and your family, too…well look no further! 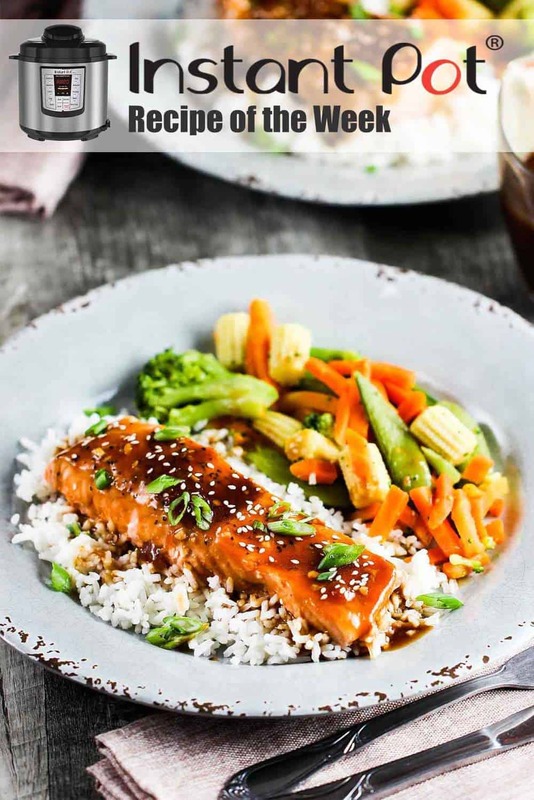 Just look at this Teriyaki Salmon! 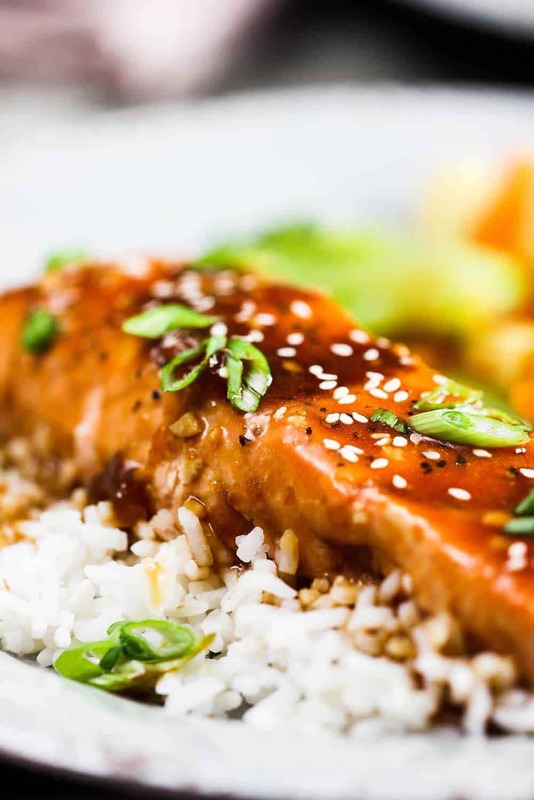 Now, go ahead and make this incredible Instant Pot Teriyaki Salmon recipe! You and your family will love it! And you’ll love how easy it is! The perfect side dishes are steamed veggies and sticky white rice! 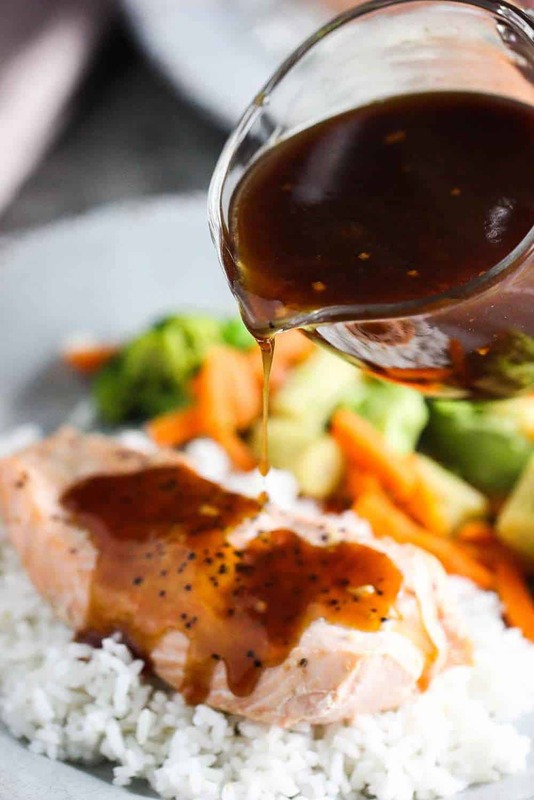 This Instant Pot Teriyaki Salmon recipe is so simple, fast...and delicious! 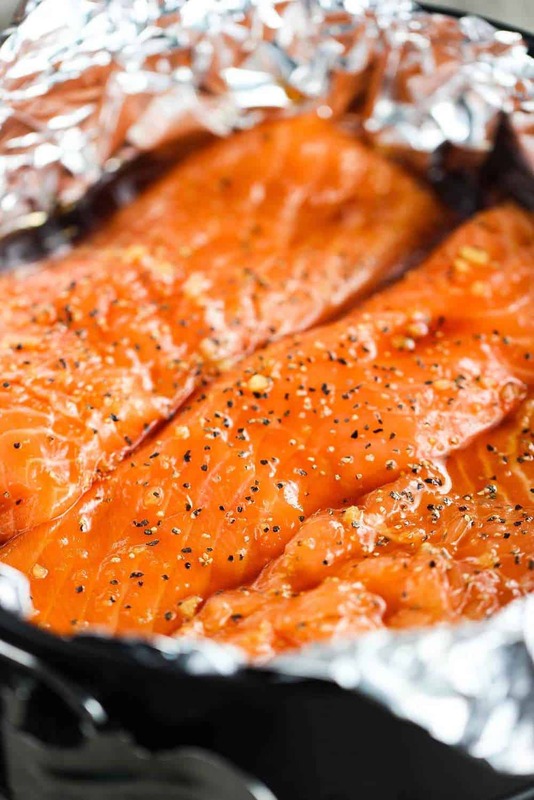 You'll want to steam the salmon in a vessel that will fit inside the IP pot. I love using my 7-inch springform pan lined with foil, but small loaf pans, or even a boat made heavy duty foil will work! Serve with steamed veggies and rice for the perfect weeknight meal! In less than 30 minutes! Get the rice ready first, because the fish comes together so quickly! In a medium bowl, mix together the soy sauce, mirin, stock, sesame oil, garlic and ginger. Season the salmon with the pepper. 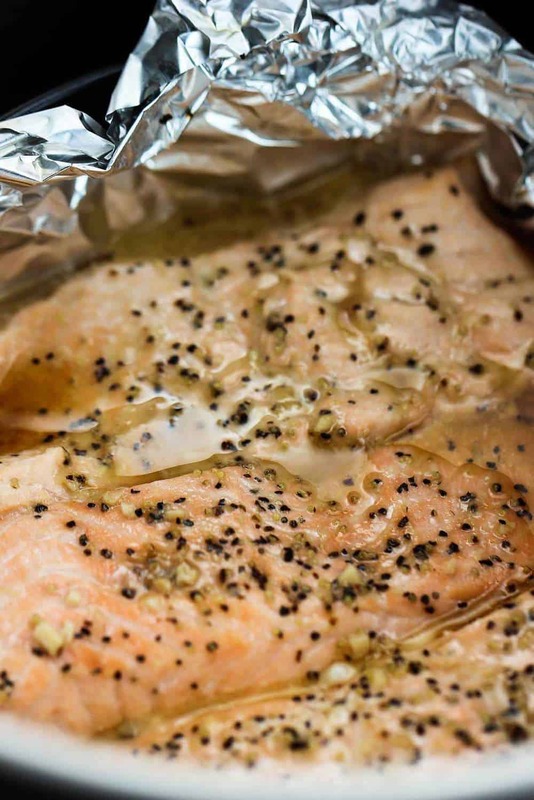 Place the salmon in a 7-inch springform pan lined with foil, or small loaf pans, or a sturdy aluminum foil packet, then loosely sealed. Pour 1/3 cup of the marinade over the salmon and place in the fridge for 15 minutes. Add 1 cup water into the Instant Pot and lower in the steam trivet. Lower the vessel with marinated salmon onto the steam trivet. If using loaf pans, you can stack them, making an 'X' formation. Lock the lid into place and select STEAM on the High setting fro 6 minutes. After cooking, Quick Release the pressure. Unlock and remove the lid. Carefully remove the steamer trivet from the pot and with a large slotted spatula, transfer the fish to a plate (best if served over steamed rice). Pour a couple tablespoons of the reduced teriyaki sauce over the fillets. Garnish with sliced scallions and sesame seeds. Pass remaining sauce table side.